World’s No.1 Life Insurance Company, LIC (Life Insurance Corporation of India) has released notification for the recruitment of Life Insurance Advisors in Hyderabad/Secunderabad. Part Time jobs in LIC with a motto of Work for Part Time – Earn for LIFE TIME with LIC. Now a days LIC agents career is a highest paid profession in the world with royal income and worldwide recognition. Top LIC Agents earns Rs.3 to 4 Crores per annum. The remuneration to an advisor will be paid in the form of Commission in percentage, of premium collected through the policies sold. The commission is not a one time on a sale made by an agent. It provides the royalty income throughout the term of policy, as long as policy holder pays the Premium agent will get the commission. Moreover the commission is hereditary i.e. it will be paid to your nominees even after your death. 1st Year Commission: 25% of Premium. 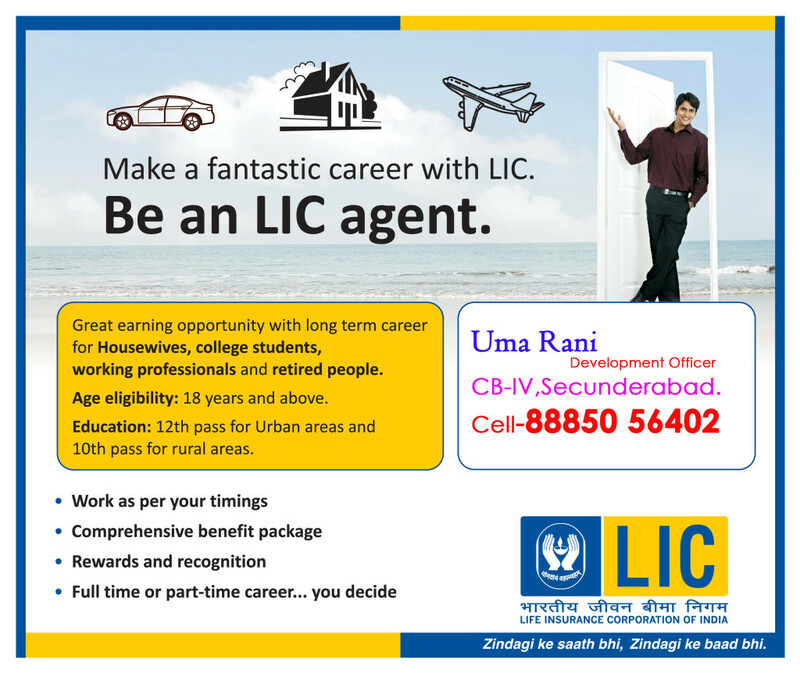 This entry was posted in Insurance and tagged Benefits of LIC Agency, career as lic agent, Join as LIC Advisor in Hyderabad, join as lic agent in hyderabad, lic agents benefits, part time jobs in lic. Bookmark the permalink.